made on special order and available now. Presently have them in black or blue colour available. Consist of all 12 ignition wires with plugs between plugs and distributors, and 2 wires with plugs between ignition coils and distributors. 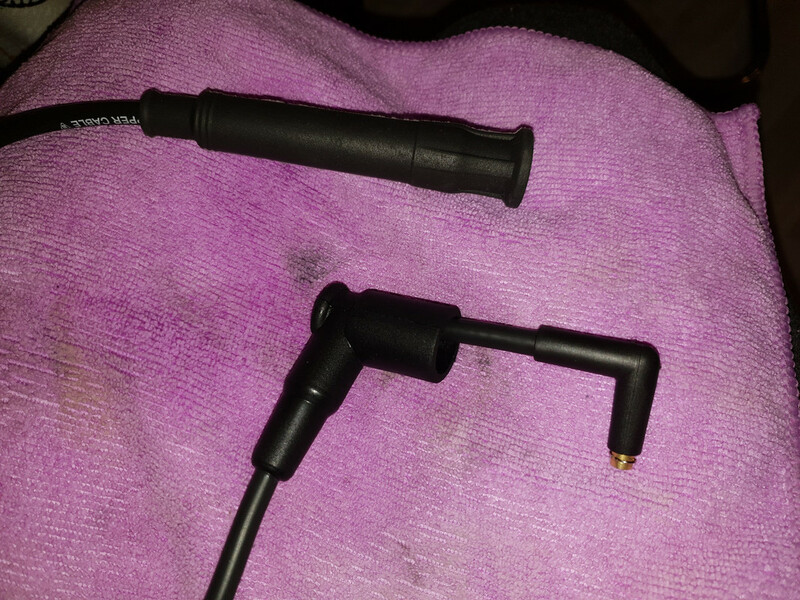 Blue set plugs are also black, same as the black set plugs. -2 donuts/speed sensors (can be delivered at extra price new, either BMW OEM, or made by FACET, whatever you like). But usually the old donuts are re-used. Instructions to refit them, see inside link. Longer delivery time for this, as no stock presently for donuts. 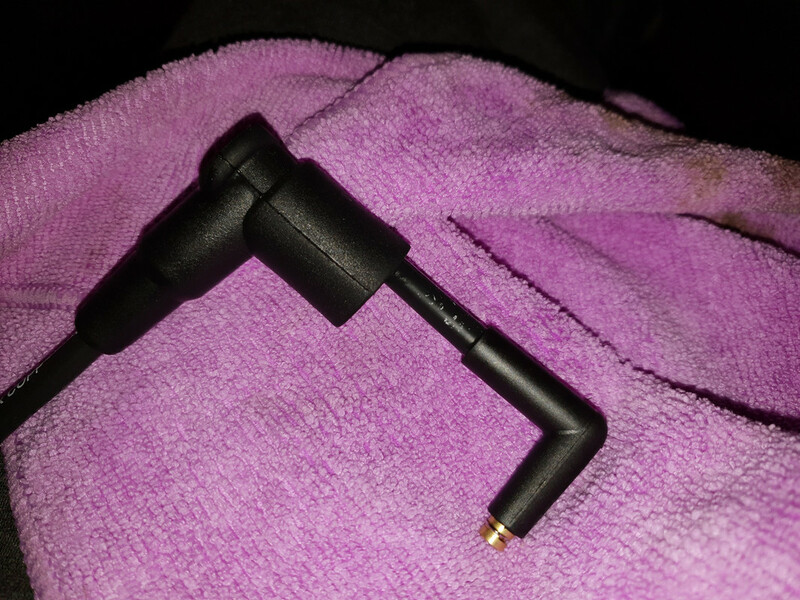 -no marten protection on the ignition wires (that was also optional on the OEM), cable 'rubber' and plug 'rubber' made of silicon material. So much softer than the OEM ones. Plugs are woodscrew type connections, easier to use than the OEM metal bush connections which sometimes fail. In case of interest send me a PM with shipping details. The approx. length from end to end incl. the boot on each side, so you can double check on your car:the one which goes between ignition coil + distributor 54 cm/21.3", 44cm/17,3", 51cm/20", 60cm/23,6", 70cm/27,5", 77cm/30", 85cm/33"
All blue ignition wires sold. Black ones on stock. 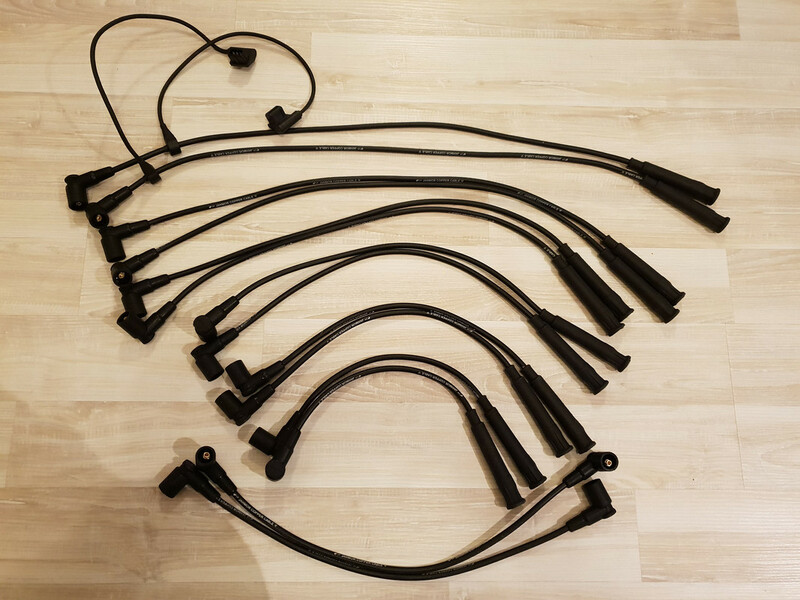 Price per set of black ignition wires consisting of 12 ignition wires between distributors and spark plugs + 2 wires between ignition coils and distributors = total 14 wires US$ 190 shipped by airparcel from Japan. Paypal o.k. Please contact me by PM with shipping address. 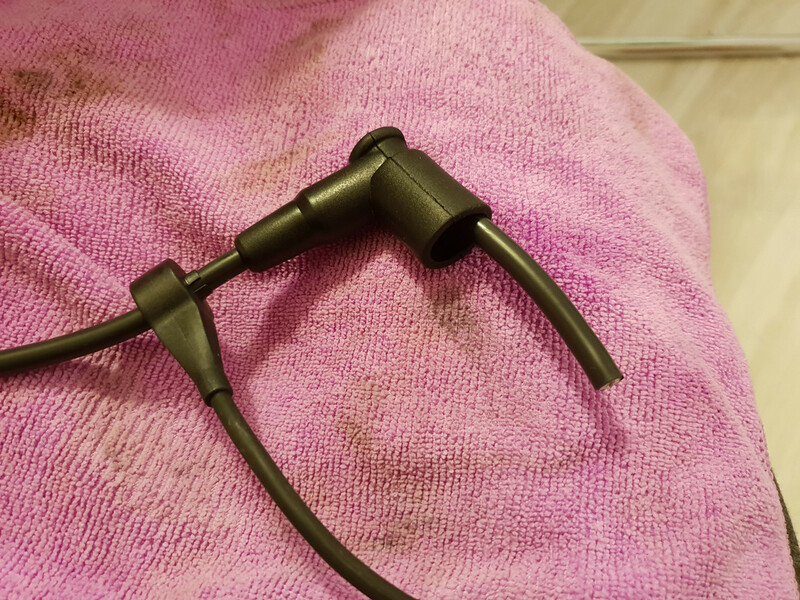 Make sure your old plastic ignition wire tubes are not brittle. I just read in the German forum about a case where someone changed on his M70 distributors, rotors, spark plugs and ignition wires on cyl. 6 and 12 and used the re-old donuts. Then he had trouble. Engine starts, runs short time with increased RPM and then dies. EML lamp goes on with ignition on and then goes out again as it should be. Diagnosis faults: fault ignition cylinder 1-6 and 7-12. That was 2 weeks ago. Today he fixed it. He noticed that he installed the cylinder identification sensors/donuts/pulse generators on ignition wires cyl. 6 and 12 the wrong way. Turned the donuts the correct way and engine runs starts and smooth. This is not the first time that I read that when donuts are not working properly or the ignition wires/plugs # 6 and 12 are not functiong, there will be engine problems. So if the M70 starts, idles for some seconds, then dies, also check the ignition wires, plugs and donuts from cylinder 6 and 12. The usual cause of running for a few seconds and then stopping is the lack of cylinder identification signals. These are provided by the inductive sensors on HT leads 6 and 12. When you get a fault with INPA ti-signal, this is the injection time signal, the base timing is derived from the cylinder identification signal. We had the same problem some years back on an 850: lack of cylinder identification signals. In our case the ignition wire boot of cylinder 12 was lose/not connected to the spark plug. Before we checked the usually subjects like fuel pumps, fuel pressure, ignition = distributors + rotors, crankshaft position sensors. Make sure you have them plugged into the right plugs? Make sure they are actually any good? Bad "donuts" have been a common problem with some replacements...(aftermarket). Another comment: Friend had same sort of problem a while back, motor would start and then died shortly thereafter. He'd brought it used from out of state. I had a suspicion after listening to the motor start and die a few times that not all cylinders were firing. I took a look and found they were from a 3 series! Popped in a spare set from an M70 and the car fired up and purred like a kitten. Turns out original owner sold car because it kept shutting off. So important is, when you change ignition wires and re-use the old donuts, make sure the donuts are installed the same way as original, not flipped. Basically it is not possible to installed them the wrong way, because the donut inner ring is conical and not round, so it should go onto the wire only one way. but some apparently squeeze it on the wrong way. Last edited by shogun; 07-24-2017 at 07:34 PM. I did not take pics, sorry. I am the impatient type and taking pics takes too long plus I don't wear gloves so I would have to wash my hand every time to pick up my camera. So hopefully my write up will be good enough to understand and if you have questions please let me know. This will be in a semi bullet/step style write up with notes, I will not bore you will some hurdle details I needed to overcome just the fixes/work arounds. First off these wires are excellent quality! The "wood" screw type connector is traditional type i.e. if you are looking at the top of the screw it is clockwise on counter clockwise off. Righty tighty lefty loosey. I laid out all wires to get the groupings done and label all the wires with 1-12 by the distributor boot. I Installed the CI sensor on 6 and 12 wires. 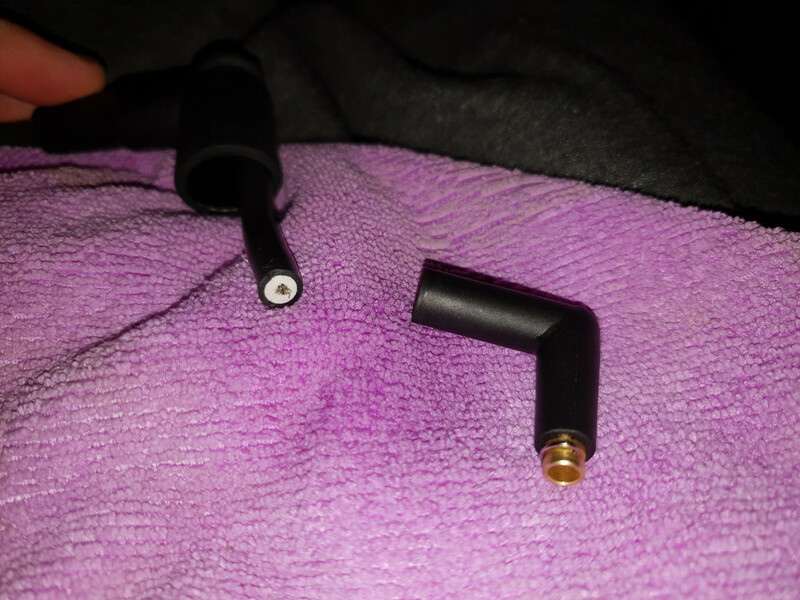 1st hurdle, I could NOT unscrew the plug ends because the rubber boot was so tight and I could not verify removal unscrew direction at this point. I just pulled the boot off with force hoping it would not damage anything else. Once that was done and the plug end was cleaned of any remaining wire in the screw portion I was able to verify righty tighty lefty loosey. Installed CI Sensors. 2nd hurdle could not screw the ends back on due the rubber boot being so tight. 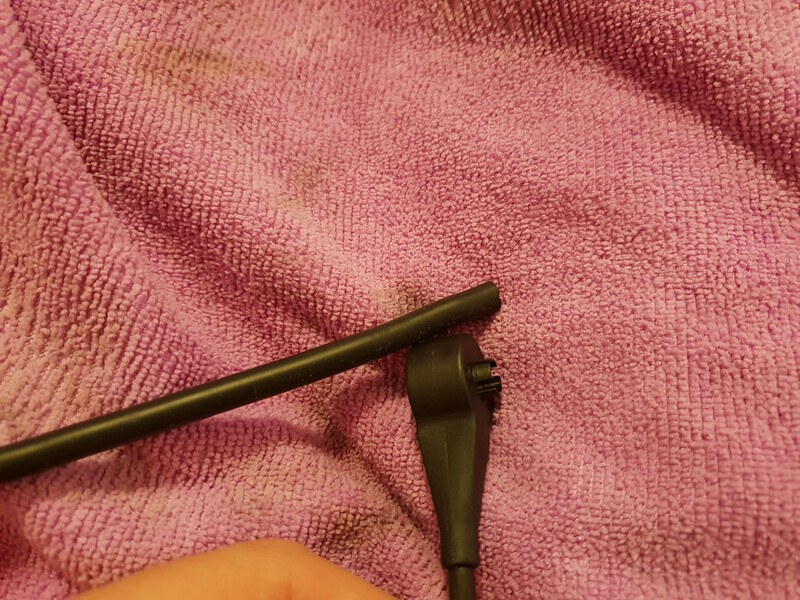 So I removed the actual plug by prying it out. Once out I slid the boot over the wire and down a few inches then screwed the ends on and slid the boot over the ends. Be careful push/pull only on the plug itself (NOT THE WIRE) when doing this so you don't pull the wire out of the plug again. I used some dielectric grease to help. Installed the wires into the guides, this took some playing around to get the wires to lay nicely. Installed wires and guides into car, unplugged at this point. Started to plug wires on to plugs. 3rd hurdle, I could not get the boots to plug onto the spark plugs, see note above. 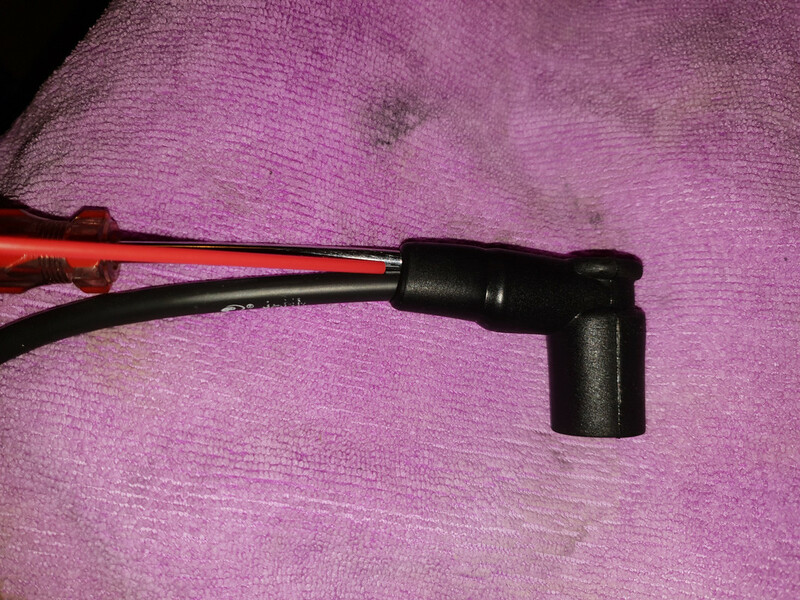 This took a while but the fix was to wiggle the plug boot around till it lined up on the spark plug and push hard. Once I realized this it was not a big deal. Started to plug wires to distributor. 4th hurdle, once again you have to wiggle the boots around to get them to plug in. After install was done just a quick double to make sure I had correct order on distributor cap I started it up. Install time: 3hours, once again it would have been about 1-2 hours if I had the forehand knowledge of the screw direction and the alignment. 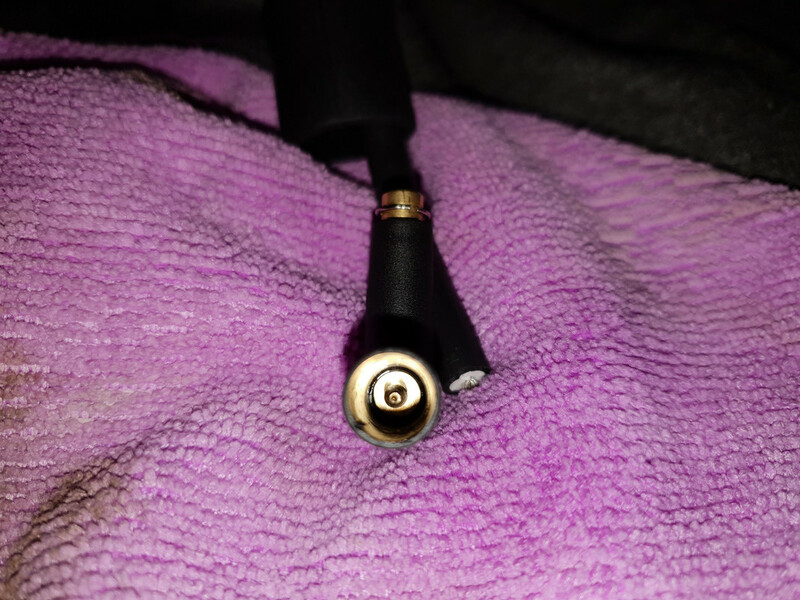 Ryan:the complete black set will be sent by EMS with tracking today to Angier, NC..
Cable - double layer of silicon with braid conductor - copper wires 1mm - tin plating. Silicon terminals with suppressor resistor (used boots and terminals are identical to the original). May be applied to vehicles equipped with LPG installation. 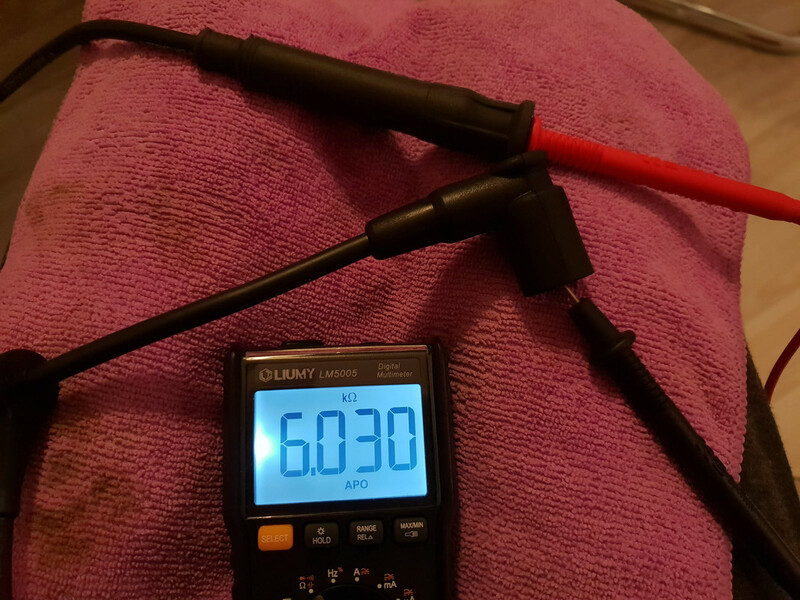 outer diameter of the black cable version is (roughly) 6.90 mm =0.271 in. outer diameter of the blue wires (roughly) 7.06 mm =0.278 in. Maker of the blue cable is Millflex England. Maker of the black cable accdg to Maker General Cable. The approx. length from end to end incl. the boot on each side: the ones which go between ignition coil + distributor 54 cm/21.3", others 44cm/17,3", 51cm/20", 60cm/23,6", 70cm/27,5", 77cm/30", 85cm/33". installation of cylinder identification sensor (donut): http://s71.photobucket.com/user/shog...nsor.jpg.html? Important Note: Never pull on the ignition wire when you want to remove the boot from spark plug. Always pull, twist and wiggle on the boot. 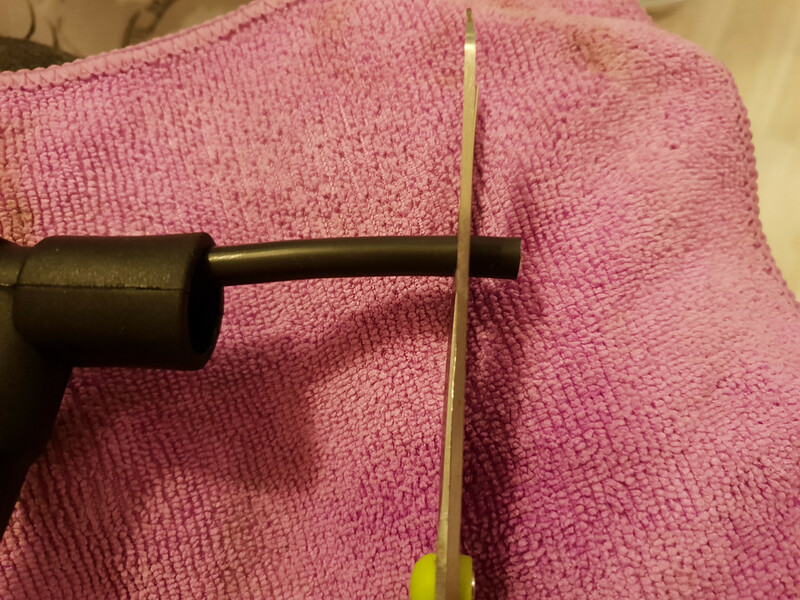 Or use a spark plug plier boot removal tool, there are special tools that perform well in difficult areas such as recessed and obstructed plugs. If you pull on the wire you might find a metal collar is left on the end of the spark plug – this is not a problem. This type of ignition boot uses a friction fit metal collar that is designed to separate from the boot if it gets stuck on the spark plug. The simplest solution is to remove the spark plug, remove the collar, and reinstall the collar into the plug. 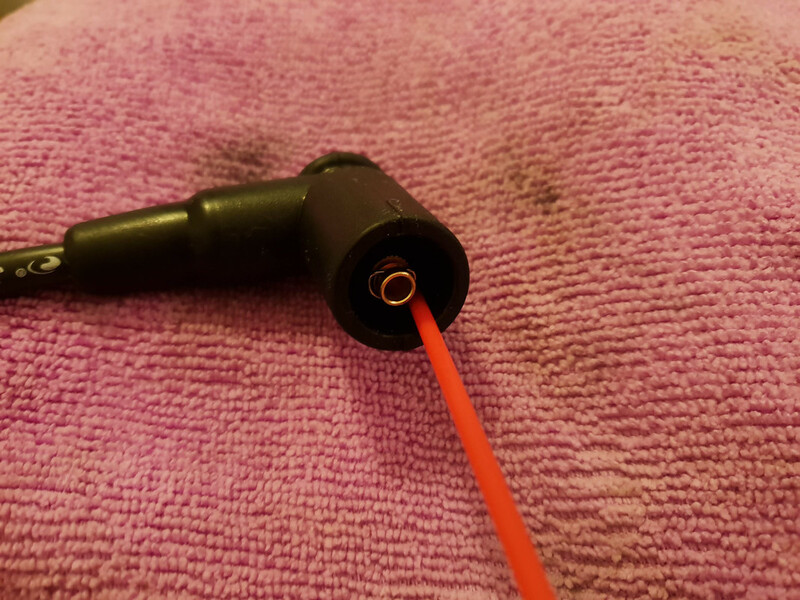 You can also try to remove the collar with the spark plug in place using long nose pliers but make sure you don't drop it; use a magnet, if required. Clean the inside of the collar and push it (small hole in first) down into the boot until it seats on the end of the wire. The arrangement is shown here; the rubber of the boot was cut away to show the parts better. The rubber can be moved back up the wire but some lubricant might be needed. Last edited by shogun; 11-08-2017 at 02:28 AM. temperature switch for e-box cooling E32 750: switch on at 44 +/- 3 degree C, switch off at 36 +/- 3 degree C.
Last edited by shogun; 07-24-2017 at 08:01 PM. 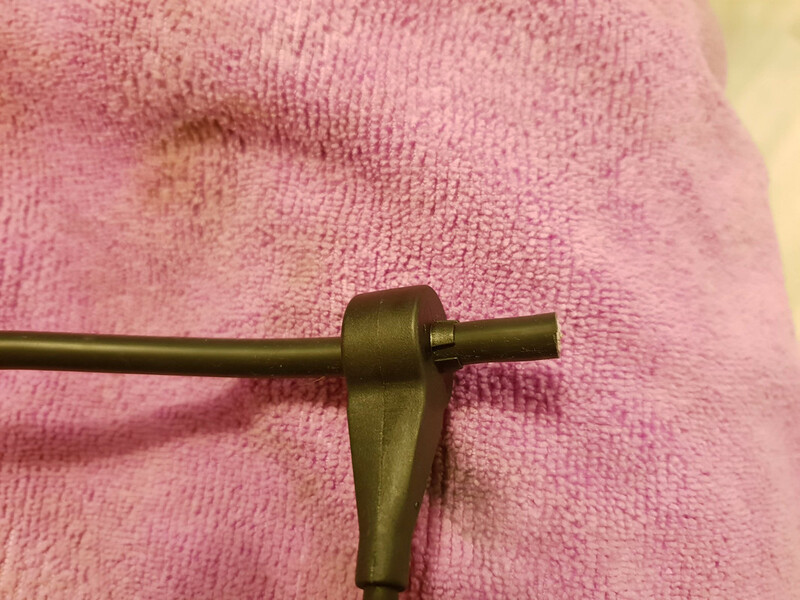 Here's a quick & simple write up by a forum member with pictures for installing cylinder identification sensors aka donuts on wires #6 and #12. These wires are identified by comparing length with the rest of the wires, them being the longest ones obviously. On the distributor boot end of the wire, get a slim flat blade screwdriver and slide it between the rubber boot and the wire. Use a lubricant of your preference, in my case WD-40, and spray it liberally. Follow up with more lubricant into the boot opening. 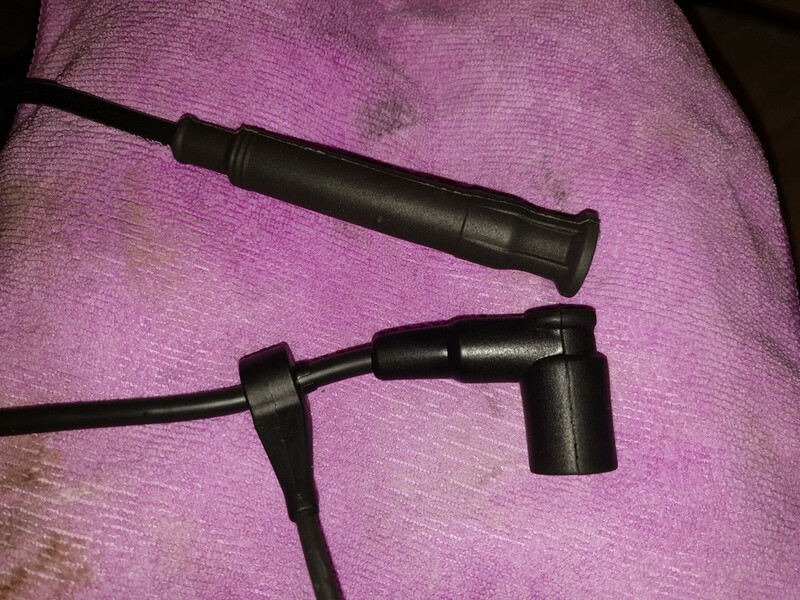 I just ripped the crank sensor wire off #6 plug wire..am I buyin a new wire set ? ?